But I tell you who hear: love your enemies, do good to those who hate you, bless those who curse you, and pray for those who mistreat you. A tremendous conviction for God during the Middle Ages became common among Europeans and Easterners. As Christianity had spread north, south, and eastward since the dawn of the millennium, many people across the continent journeyed to the Holy Land to see for themselves where Christ had lived and where the gospel events had played themselves out. The Christian communities native to the Middle East welcomed the visits of their foreign brothers. Coinciding with the introduction and spread of Islam in the seventh and eighth-centuries, the lower Mediterranean Christian community began to be violently persecuted at the hands of neighboring Islamic states. Non-Muslims, or "infidels" were executed in large numbers in numerous parts of North Africa, Syria, and Egypt. Cities such as Alexandria, Antioch, and Jerusalem suffered great destruction. Even some Christian churches as far north as Rome were destroyed by Moslem attacks in the year 846. In 1009, the Caliph Hakim destroyed the rebuilt Church of the Holy Sepulcher in Jerusalem, killing many Christians and Jews in the process. By 1071, Islamic Turkish Seldjuks came to power in Armenia, Syria, and Asia Minor. The Seldjuks began their own holy war against Christianity which included the capture and slaughter of European Christians who were making pilgrimages to the Holy Land. European voices finally insisted upon a response. The Church of Rome's Pope Urban II proclaimed the need for a military venture to rescue Middle Eastern Christians from their Islamic captors, and to retake the city of Jerusalem. The very first such crusade coalesced within the very next year - AD 1096. Responding were many thousands of common citizens whose zeal for the Church of Rome and concern for their Arab-Christian brothers far surpassed their military know-how. They took up what arms they had, many selling all but their most needed possessions, and began the march toward Jerusalem. In some cases entire families mobilized themselves for this perceived holy cause. Tragically, the noble venture ended in massacre for nearly all of them, never even reaching Jerusalem. The next crusade, the official First Crusade, was launched later that same year. Large numbers of trained knights and archers were mobilized this time, rather than zealous citizenry. Four separate expeditions of Crusaders converged in Constantinople. Proceeding out from there, they began battling towards the holy city. In the year 1099, their goal was achieved with the capture of Jerusalem. The easy part was over. The hard part would be the next two hundred years of trying to defend the city and surrounding area. Had European powers built on this success, one cannot imagine how different history would be today. Tragically, the mixed motives of the Crusaders and those behind them proved to be a very fatal flaw in this temporary peace. 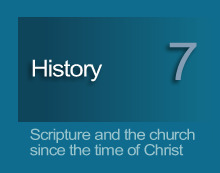 There followed seven more official crusades over the next 195 years. These subsequent ventures, initially sent to shore up existing forces, lacked the nobility of a rescue mission that had adorned those first expeditions. While earlier missions had admittedly not been free of criminal acts, the brutality of later Crusades was great. The next six Crusades would be done far less for heavenly praise and much more for earthly plunder. Note that Crusading forces were never the direct resource of any church, but of monarchies; kings who recognized great benefit in publicly supporting any cause believed by the masses to be godly. The most influential and most high-profile church at this time was the Church of Rome. Thus the publicly honored Roman Church became the source to whom kings listened and took direction in determining whom to rob and destroy. Supportive monarchs listened to Rome even while certain Christian communities (ones unwilling to come under the authority of Rome's papal office) were incrementally added to the enemies list. This would accrue to even include a large number of Christian communities in the Holy Land. Thus some of the very first people the Crusaders had set out to protect were later classified as just another enemy to be destroyed. This veritable war by Rome against all non-Catholics increased over time to become the period of the Inquisitions. The latter Crusades also targeted Muslim nations that had not only tolerated Christianity, but had been very amenable to the First Crusade's overthrow of ruthless Islamic Caliphs. The Muslim people's previous support, of course, meant nothing to newly arriving Crusaders. Many of them were convicts recruited from European prisons; undesirables Europeans were glad to send far away and, given the alternative, the prisoners were glad to oblige. This vicious targeting of Muslims understandably fueled their hatred of the Europeans. It also fueled Muslim hatred of Christianity which was being perceived, albeit wrongly, as the Crusaders' motivation. Ironically, the Crusaders' merciless attacks eventually fostered the very hatred that would unify the Arab nations under Islam and, as a consequence, usher in the Crusaders' own defeat. By 1291, combined Islamic efforts finally drove the northerners out of Jerusalem for the last time. A Christian missionary, native to Egypt, told me that these terrible events are still actively remembered in certain modern Islamic holidays. Thus the perpetuated memory of these ancient Western evils carried out on Islamic nations in the name of Christ remains a significant contribution as to why those nations so hatefully regard the "christianized" West, especially America, as the Great Satan. The Crusades are sometimes referenced in conversation, but rarely in the context of specifics such as who, what, when, and why. Some people offer the Crusades to be a reason to disbelieve in God or the Bible, but that only reveals the gaps in their knowledge of history and of the Bible. This section starts to fill in some of those gaps with names, dates, and places.